Hazel Anne (“Anne”) Niblet (nee Strode), of Ft. Lauderdale, Florida, passed away on Saturday, August 3, 2018, at the age of 91. Anne was born in London, England, on August 1, 1927. After arriving in the United States with her husband, James Wright, and son, Paul, as well as with her mother Florence Jane Strode, she lived in California and Maryland, before settling in Ft. Lauderdale in 1972. In addition to her many friends and volunteer colleagues in the Broward Hospital Auxiliary, she is survived by her three children: Kathy Hildebrand, of Acworth, Georgia; Suzanne Murtha, of Aurora, Colorado; and Paul Wright, of San Francisco, California. After an eclectic career that included hosting her own local television show, bookkeeping and retail, Anne devoted herself over many years to volunteer service in the community. 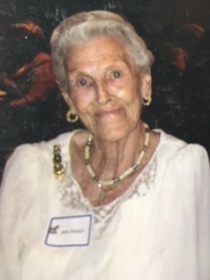 She was especially active in the Broward Health Medical Center Auxiliary. All of us who knew Anne will remember her for her deep and cheerful belief in the importance of helping others, for her warm sense of humor – and for her unfailingly-crisp, lifelong British accent. A memorial service and celebration of Anne’s life will take place on Saturday, September 15, at 1 pm, in the chapel of Broward General Hospital (inside the main entrance), 1600 S. Andrews Ave., Ft. Lauderdale, Florida.